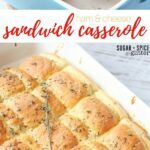 Sandwich casseroles are now my go-to potluck contribution and a high-rotation weeknight supper. There are just so many ways to have fun with this concept, and without fail they are incredible. 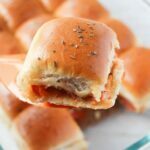 Soft, buttery bread that gives way to melt-in-your-mouth sandwich fillings like melted cheese, hot meat, and sauteed veggies. There’s no going back after you’ve tried one of these fresh from the oven. 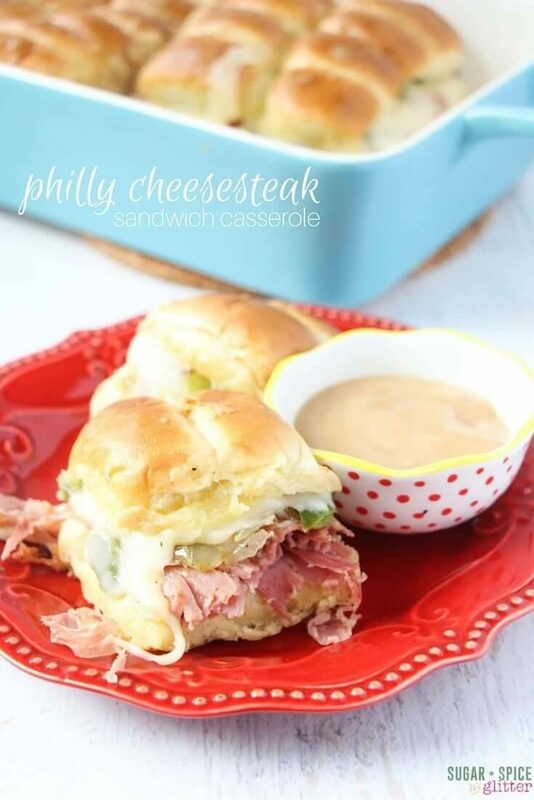 It’s been a long time since I’ve had a proper Philly cheesesteak so I jumped at the chance to make a low-key version that I knew the kids would love, too. 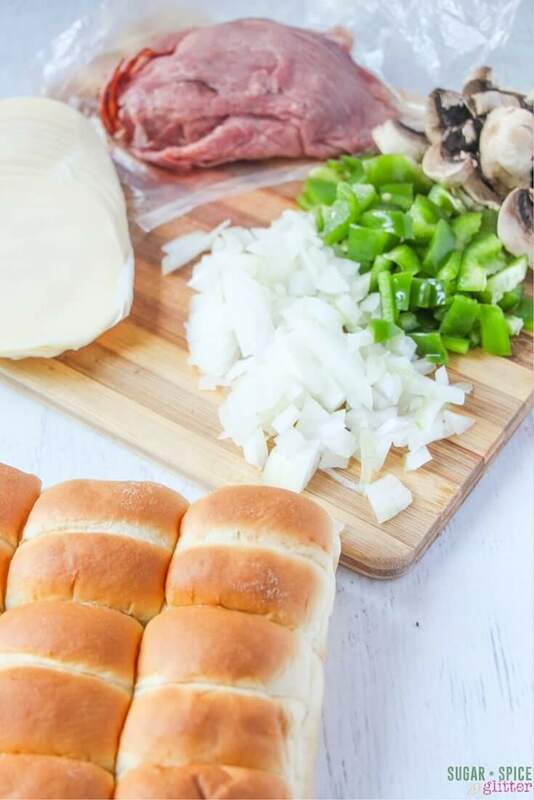 Now, an authentic Philly cheesesteak should be made with thinly sliced beef, topped with provolone cheese, green peppers, mushrooms, and onions, all stuffed into a hoagie roll and served with beef au jus on the side. 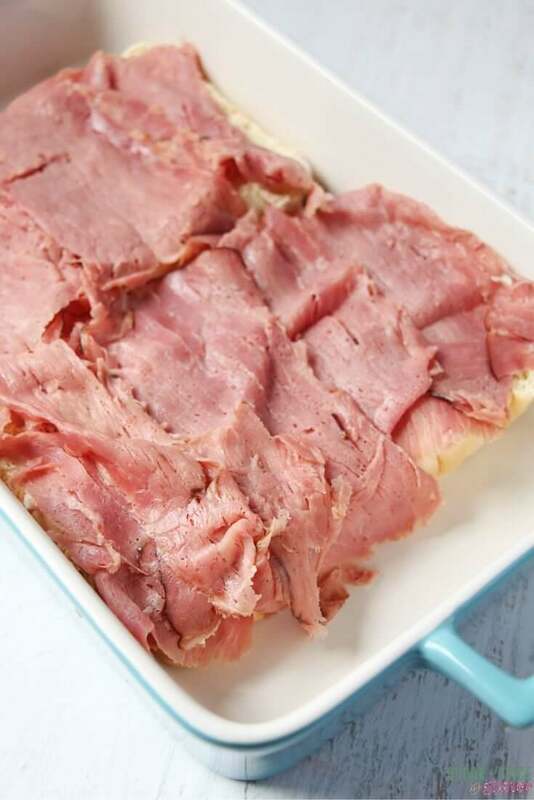 I’ll be sharing a more authentic recipe with you soon, but for now I’m sharing an easier version that relies on shaved beef from the deli but still packs some amazing flavor. 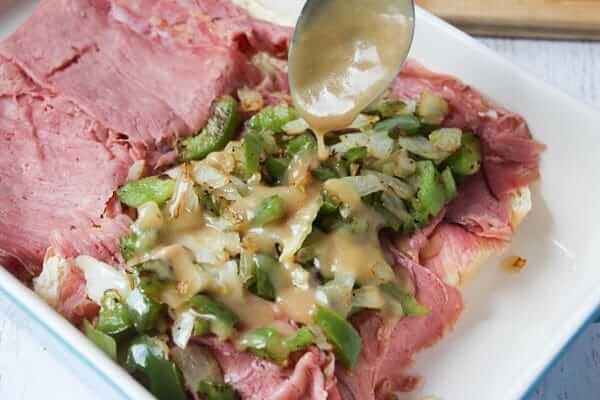 We kept the provolone, green peppers, and onions and made a cheater au jus with some beef stock. 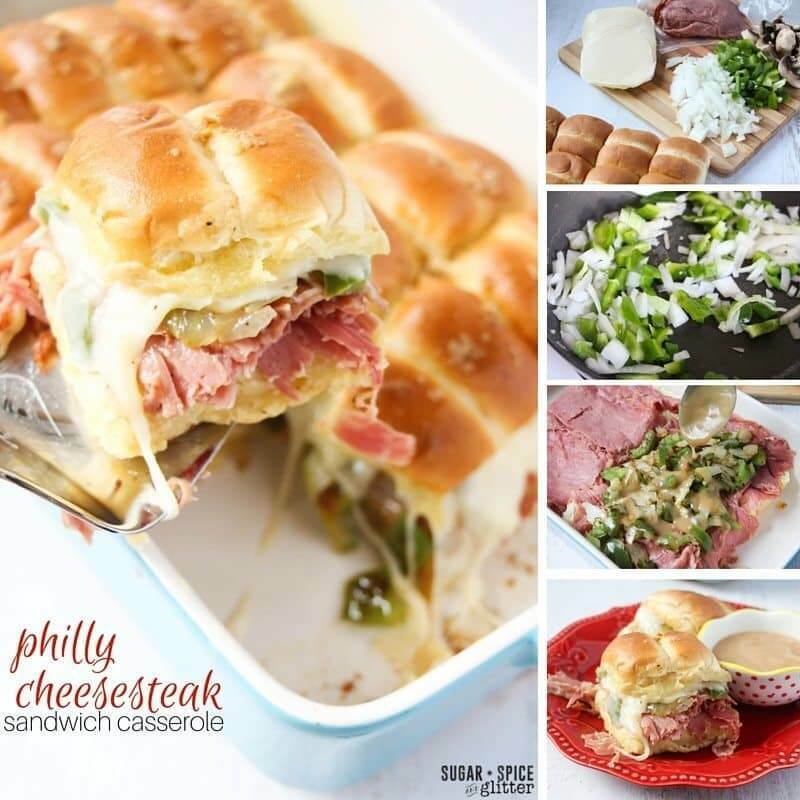 If you have the time to cook up a steak first and thinly slice it for the Philly cheesesteak casserole – go for it! Pre-heat oven to 350F and grab a large casserole dish, cutting board, frying pan, and two sauce pans. Chop up the veggies and slice the sheet of bread rolls in half across their middles so that the entire sheet opens like two big pieces of bread. 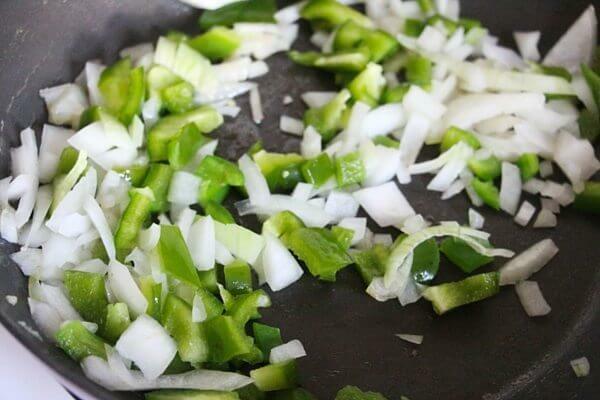 Sautee the veggies in a tablespoon of butter or oil until the onions are translucent and the green onions are starting to brown. Melt the 1/2 cup butter, dijon mustard and Worchestershire sauce all together and set aside. 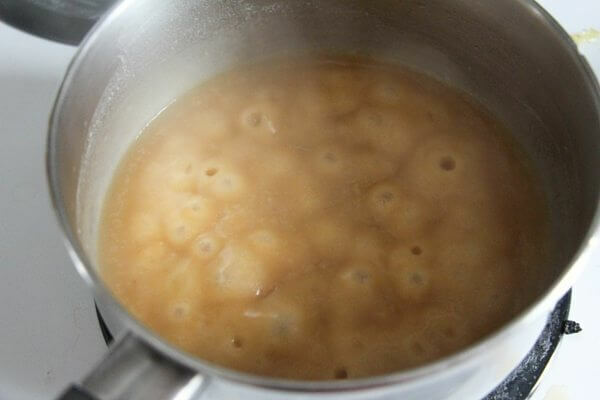 For the cheater au jus, add the remaining tablespoon of butter, 2 tablespoons of the beef stock and flour to a saucepan over medium heat. 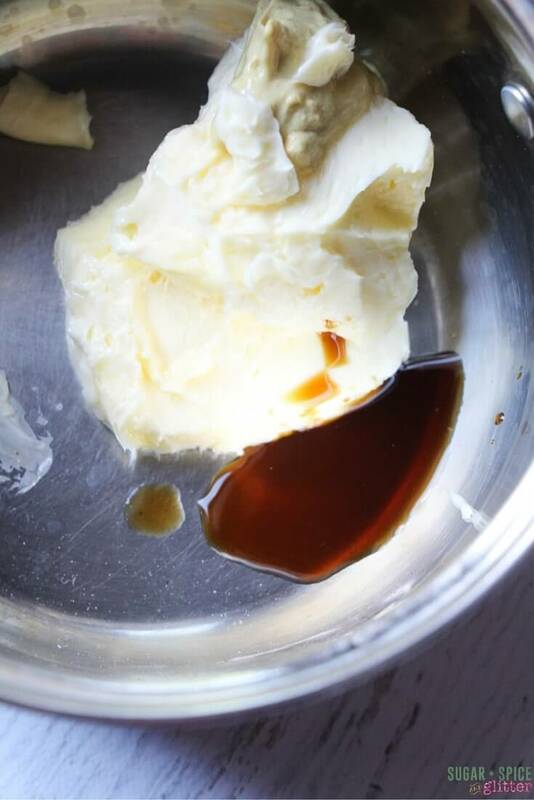 Allow to develop to a caramel brown color before adding in additional beef stock. Use more or less beef stock to achieve the consistency you want and then allow the mixture to come to a boil before taking it off the heat. 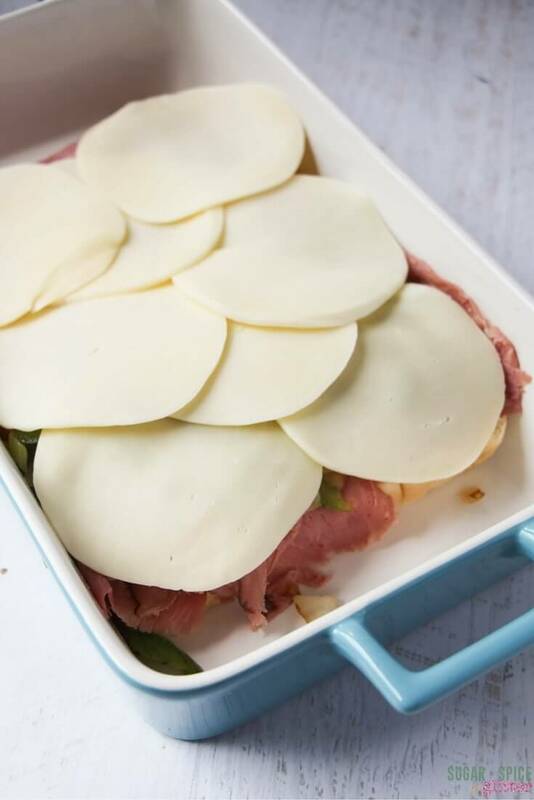 You’ll also notice here that half of our sandwich casserole was vegetable-free. My dad is a huge Philly cheesesteak fan and hasn’t eaten a vegetable in his whole adult life aside from the occasional piece of corn… unless tomato juice counts as a vegetable? Anyways, I wanted to be able to share this with him so I kept his portion veggie-free. Eh, do what works! Drizzle a generous amount of that beef sauce onto the vegetables, but save some for dipping the sandwiches in later. 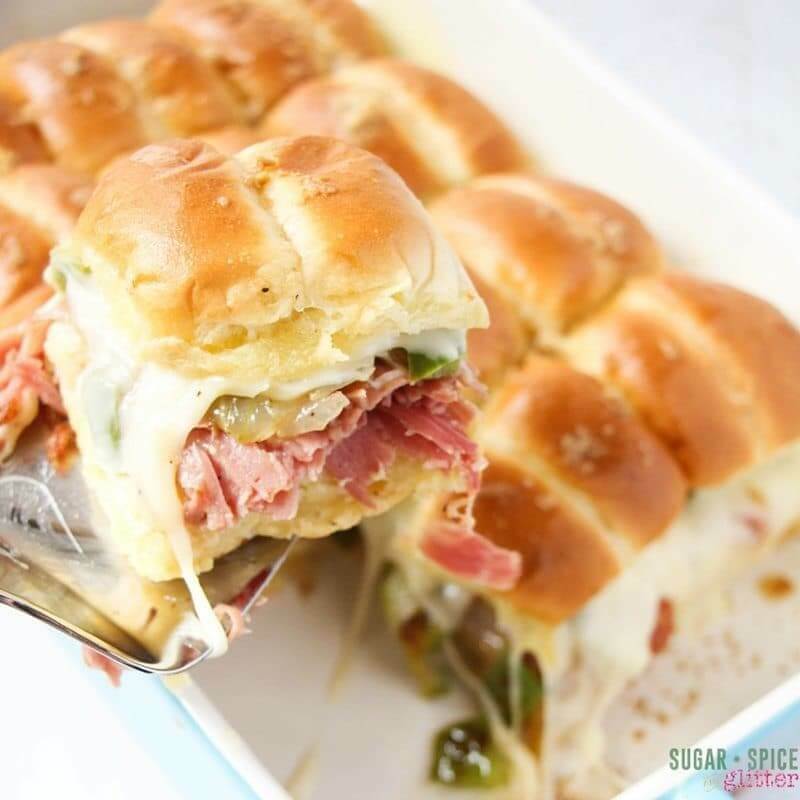 Top with the provolone cheese and top half of the rolls. Pour the melted butter mixture overtop of the buns and then cover with tinfoil. 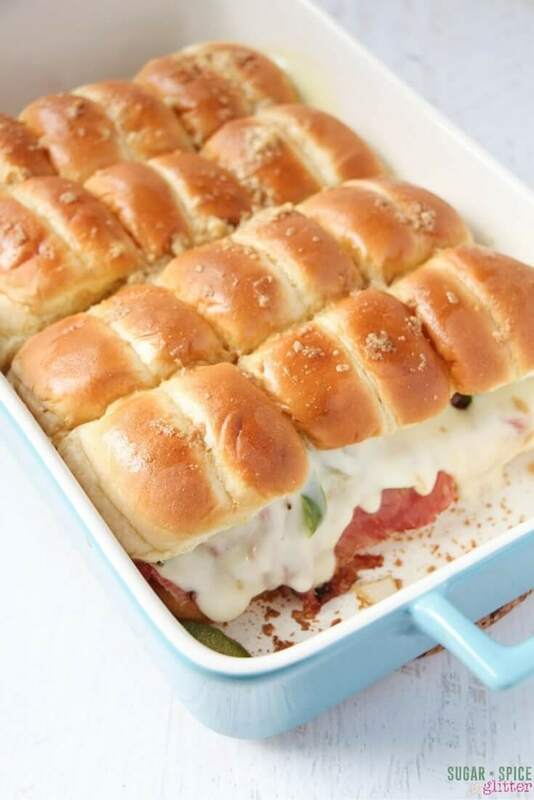 Bake for 25-30 minutes until all butter is absorbed and cheese is deliciously melted. Allow to cool for a couple of minutes and then cut and serve alongside the cheater au jus for dipping. 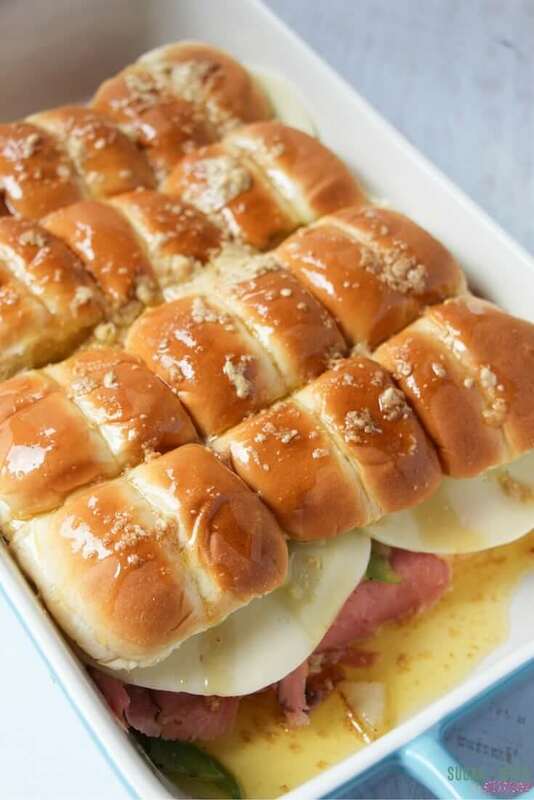 Have you ever tried a sandwich casserole? 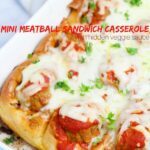 Make sure to pin this for later for some easy weeknight supper inspiration. And for more easy weeknight supper inspiration check out my main recipe page, or our paprika chicken skillet or Mongolian beef stir fry. 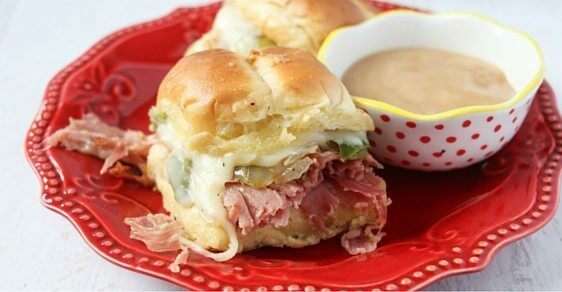 Made these last night, used deli sliced roast beef. They were awesome! 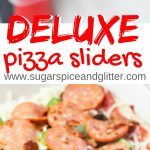 Next I’m going to do hoagies using ham, pepperoni, mozzarella, and pizza sauce!